Finally, I’ve found the statistic I’ve been searching for since 2014 – to solidify what I have always known, but couldn’t prove, about silver’s rock solid fundamental outlook. However, it will have to wait until the article’s end, given how many other, extremely important topics I need to address. Starting with, the lunacy of what historic market manipulation has caused; i.e., “dotcom valuations in a Great Depression Era.” Which ironically, stair-stepped exponentially higher after Election Day, when the “BrExit times ten” Trump victory shocked the powers that be’s’ best laid election rigging plans. Not to mention, “ECB’s balance sheet now the size of Japan’s GDP”; and better yet, “Bank of Japan plans to drop inflation target at Thursday’s meeting.” The former of which, has statistically proven to be the single biggest contributor to financial asset inflation; let alone, when combined with the cumulative efforts, overt and covert, of the world’s hyperinflating Central banks – in their relentless, doomed-to-fail efforts to prolong the terminal phase of history’s largest, most destructive fiat Ponzi scheme. Regarding the latter, in the spirit of last week’s “ding dong, the Fed – and the Precious Metals ‘bear market’ – is dead” – following Whirlybird Janet’s historic, and unexpectedly, dovish Humphrey-Hawkins speech; it’s equally appropriate to – if indeed, the BOJ drops such language from its statement – proclaim Shinzo Abe, Haruhiko Kuroda and friends down for the count; and with it, financially speaking, the “Land of the Setting Sun” itself. It’s been more than four years since Shinzo Abe was elected under his “Abenomics” plan to double the money supply within two years, and “rescue” Japan from “deflation.” Four-plus years later, the money supply is still rising exponentially – to the point that the BOJ’s balance sheet, at $4.5 trillion, is now equal to the United States (excluding “off balance sheet” holdings), despite Japan’s population being roughly a third of America’s, and its GDP a mere one-quarter. Moreover, Japan has now had negative interest rates for 17 months, and the BOJ has purchased at least 10% of the entire Nikkei stock exchange – to the point that it is a significant holder of essentially all Japanese corporations. And yet, Japan – famous for being one of the world’s leading exporters; has had a trade deficit, nearly to the day, Abenomics started – with an average GDP growth rate over this period of…wait for it…ZERO. Thus, it’s no coincidence that Abe’s “approval” rating dropped this month to a record low 29%; and consequently, that it’s becoming a fait accompli that both he and Kuroda will be imminently forced out of office. Also according to the WSJ, the BOJ will cite the “Amazon Effect” for its failure to stoke inflation – ignoring, of course, the impact on two decades of hyperinflationary policy on the world’s most indebted nation. Last I looked, rising rates are bad for bonds – and really bad for Central banks that own half of the entire government bond float; much of it, purchased at zero or negative interest rates; to the point that its balance sheet, at $4.5 trillion, is the same size as the entire Japanese economy! Yes, Amazon.com is destroying Japan, if you believe the WSJ’s assertion that this will be what the BOJ “blames.” No, it couldn’t possibly be the historic industrial oversupply and debt accumulation caused by two decades of unfettered money printing – catalyzing the unstoppable tsunami of deflation I wrote of in my must-read January 2015 article, “the direst prediction of all”; which, I might add, was penned when the CRB Commodity Index, “oil PPT” support notwithstanding, was at 230, versus 176 today. Nor could it be Japan’s “demographic hell,” which I first discussed five years ago; which sadly, is exactly what much of the Western world faces today – particularly European geopolitical flashpoint nations like Germany and Italy. Yes, I know Central banks are famous for blaming everyone but themselves for their failures – in this case, “deflation,” despite a surging cost of living for the “99%.” However, to blame one of the most innovative technology companies in history for simply doing their job would be a new credibility low for an institution already plumbing the depths of the concept. Which fortunately, the financial markets will be on like “white on rice” – in realizing that like the BOJ; the Fed, ECB, BOE, SNB, and PBOC – amongst others; have all failed miserably, using the same tried-and-true Keynesian methods. And thus, that their only remaining “tool” is the one used, abused, and destroyed by every fiat-currency-issuing Central bank throughout history; i.e., hyper-inflation. Gee, I wonder how gold and silver – trading at historically suppressed prices, at their lowest ever inflation-adjusted valuations, will do in such an environment. Speaking of Ponzi schemes and deflation, how about John Deere stock – in the spirit of the headlines commencing today’s article – trading at an all-time high, amidst this horrific description of its current “business model?” I.e., financing its bankrupt customers in the dramatically “deflating” agricultural economy (no “Agricultural PPT” here); with “off balance sheet” vehicles to maintain the illusion of growth, knowing full well it will end in tears. I.e., precisely what Cisco did when it financed insolvent dotcoms’ router purchases in the late 90s; what Fannie Mae and Freddie Mac did by monetizing the mortgages originated by Ponzi con artists like Countrywide Credit; what General Motors Acceptance Corporation – i.e., GMAC – did in subsidizing subprime auto buyers; and what the Federal government (which was forced to nationalize Freddie and Fannie, bail out GM, and force Countrywide’s sale to Bank of America) is doing today, in “guaranteeing” more than a trillion of largely unpayable student loans. Again, what could possibly go wrong? On that note, it’s on to the “holy grail of bullish silver statistics” – which I assure you, is worth the wait. Which is, an actual estimate of silver’s intermediate-term mine production profile; like the one several mainstream analysts have predicted for gold – per December’s “most important, and bullish, gold chart you’ll ever see” – that global gold production, which peaked in 2015, is expected to plunge nearly 20% by the year 2024. In silver’s case, I have forecast a similar decline for silver since 2014 – when the aftermath of three years of Cartel destruction all but annihilated the mining’s industry’s outlook. In three “Miles Franklin All-Star Silver Panel” webinars – the first in October 2014, and the last in April 2017; some of the industry’s leading analysts – including David Morgan, Chris Marchese, and Steve St. Angelo – offered similar prognostications based on a variety of statistical facts and anecdotal evidence. However, because two-thirds of silver production is the by-product of primary gold, copper, and lead/zinc mines, it is far more difficult to generate industry-wide silver mining forecasts than gold, which is principally produced from primary gold mines. Thus, when I came across this study yesterday from Treasure Coast Bullion Group, titled “the case for the return of $50 silver,” I couldn’t have been more pleased; as finally, my “Holy Grail” silver statistic was to be found. 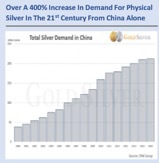 In fact, not only did it include their estimate – based on the analysis of leading silver consultancies like GFMS – that silver production would fall by roughly one-third over the “next several years”; but the additional Holy Grail silver statistic of Chinese silver imports since the turn of the century; which is equally difficult to source – and as you can see, equally bullish. 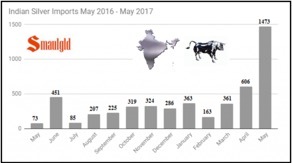 Combine this with the recent news that Indian silver imports have exploded to levels on a pace to exceed 2015’s massive, record-high 8,529 tonnes – and you can see why I have been unprecedentedly bullish lately about silver – here, and here, and here. To that end, if you have interest in purchasing silver – or storing it, via what I believe are the bullion industry’s best storage options – we humbly ask you to give Miles Franklin a call at 800-822-8080, and give us a chance to earn your business.